A while ago I noticed an interesting trend in the strength community. While this isn’t all encompassing, I have found that there is a significant amount of people in one camp or the other. The issue here is the squat versus the deadlift. You may have noticed it, too. I frequently see people who favor one lift or the other, sometimes to the point of exclusion. While I feel that there is a definite benefit to both lifts, there are some important, and interesting considerations for both as well. Let’s look at both lifts first. To most people, the squat and deadlift look essentially the same. After all, they use primarily the same muscle groups and both are excellent for building muscle and strength. For most people the difference between the two is the bar placement. Other than that, they’re pretty much the same, right? Or maybe not. It’s true that both the squat and deadlift are very similar lifts. True, they do utilize predominantly the same muscle groups. But there is a very important difference between them: both are distinct movements with separate kinetic sequences. What does that mean? Basically, it means that they fire those muscle groups in totally different patterns. Just like running forward and running backwards are distinct movements, so are the squat and deadlift. A 2009 study by Hales, Johnson and Johnson examined just this issue. Basically the study found that the squat is essentially a synergistic, simultaneous movement (hip, knee and ankle extend together) whereas the deadlift is more of a segmented, sequential pattern (hip, knee and ankle extend in a sequence). OK, so what does this even mean to you? Well, for starters it indicates that one exercise is not a substitute for the other. As I said, it’s become quite common for people to focus only on one lift, with the argument being that one improves the other. In some powerlifting circles in particular it has become quite common to emphasize squatting over deadlifting based on this argument. Since both movements emphasize similar muscles, it’s true that working one may help the other by means of strengthening those muscles; however, it’s important to realize that they are distinct movements that both need to be trained to retain proficiency. So what about for athletics? Powerlifters obviously need to be strong in both lifts since they compete in them. But does a linebacker need both? Before you start writing angry letters and comments, hear me out. We just learned that the squat is a synergistic movement pattern and the deadlift a sequential one. Think about this: when a lineman explodes into another player is the movement synergistic or sequential? My argument is that, for the sake of sport specificity, the squat is superior (in most cases) to the deadlift. Pay attention here, because what I’m not saying is that athletes shouldn’t deadlift. 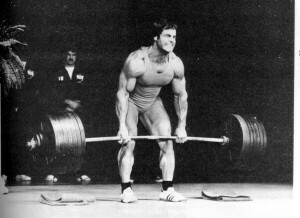 The deadlift is an immensely important lift, especially for building raw, starting strength. I’m just saying that the squat may be a little more sport specific. Another benefit to the squat over the deadlift is that squats tend to not fatigue the CNS as much as deadlifts do. CNS fatigue is important no matter the athlete, but when we’re dealing with athletes who still need to function in school and at work, too, it becomes critical. The deadlift is still without rival in my mind. It creates monstrous strength and is great for teaching powerful hip extension, which is most certainly a valuable attribute for sports. So if you take nothing else away from this article, I hope it’s this: the squat and deadlift are both key components to any exercise program, but sport specificity should be the guide that determines their inclusion in your workouts. Good article. I personally do both with my athletes but tend to lean more towards squat variations more throughout the year. Both lifts are definitely vital. It just seems as though squat patterns have a slightly more accurate transfer to most sports. I try to incorporate both into my training, but I must admit I prefer the deadlift. It seems to fit my particular body structure better. But I always try to incorporate some squatting. Right now I’m really concentrating on front squats to work my hip strength. Seems to be having great carryover to my pulls. Great article! Mike I definitely agree that some people will have a tendency to drift towards one lift or the other. The past few months my lower body work has been predominantly squatting but there have been times where my training was the total opposite. Interesting that you feel the front squats are transferring over to you pulling. I have been doing only FSs for the past couple of months and have noticed no transfer. But then again I haven’t been pulling at all and when I do I pull sumo. What kind of stance do you deadlift from? My dead lift is 475 max. However, I can only properly squat about 225 .. What’s gong on w his picture ?? Could be a technique issue. Could be your build. Could be a combination of both. Most people excel at one over the other but a discrepancy like that says to me that something else is going on there. Stupid article. The deadlift is proven superior to the Squat in all athletic sports. The way the deadlift makes the muscles fire is very much the correct way for sprinting and jumping movements and as the basis for hitting and throwing power too. The Squat produces a completely unnatural movement pattern that is really only superior for things like cycling which are highly quad dominant. Seriously these threads need to be screened for factual accuracy. Even just from a lay point of view the deadlft “seems” like a natural and better movement where as the squat does not.